Our crane operators, Scott Fladung and Shain Wilke, are NCCCO Certified. Pricing varies based on area and travel time. Please contact the office at (970) 669-3925 or send us a text message to (970) 689-2611 to schedule your rental. of the actual hours or 5 hours, whichever is greater. of the actual hours or 8 hours, whichever is greater. 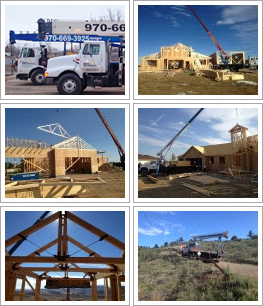 Brocc Equipment is a Northern Colorado-based company that provides crane service for residential and commercial construction projects. Our Operators, Scott Fladung and Shain Wilke are NCCCO Certified. We have four boom trucks available for commercial and residential service. We serve Northern Colorado and the Denver Metro area including Loveland, Fort Collins, Greeley and surrounding communities. Our drivers are NCCCO Certified.